Who knew attempting a world record could transform your club? More than 300 participants fill Palacio Hall for the Beetle game world record attempt. The event planning team from the Rotary Club of Marbella-Guadalmina, Spain, was awed by the first sight of the hall they had to fill. We have drawn 80 people to our walks or events before, but aircraft hangar might be the best description for the room we were looking at. It had been generously donated free of charge by Marbella Town Hall, who have been very supportive of the expatriate community. The space was also free of tables, chairs, a sound system, a stage and several other necessities for putting on a large public event. Rotary clubs worldwide marked the 111th anniversary of the first Rotary club meeting by holding an event, hosting a fundraiser, or lighting a notable building. Thanks to the more than 70 clubs that sent us photos of their events, some of which are shown above. We could not use them all, but clubs are also posting their photos on Facebook using #RI111. Learn more about Rotary’s history. Download the Rotary 111th anniversary image to share on social media. South America’s largest city, São Paulo, Brazil, is playing host to Rotary’s largest event of the year, the annual convention. More than 14,000 Rotary members from over 100 countries have come together to celebrate service, exchange ideas, and relax among friends at unforgettable concerts and social events. Experience the excitement of the convention on our sister blog, Convention Insider. Craig Alford planned to ride a push bicycle across Australia to raise money for charity, but he hopped on his souped up Hustler Super lawnmower instead. Alford, a member of the Rotary Club of Armadale and assistant governor of District 9465 in Western Australia, sells lawnmowers and other equipment at his business. 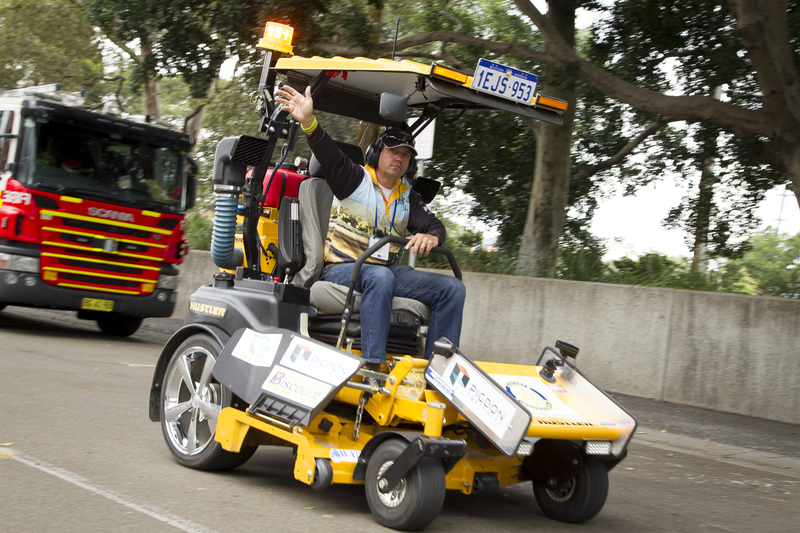 He made his grand entrance by cruising past thousands of Rotarians on the main drag at Sydney Olympic Park. Then he threw down a couple of spins on the mower to get the crowd pumped up — and to open up some wallets. He’s riding for mental health research, prostate cancer research, and polio eradication. Alford hopes to raise $1 million Australian dollars over 7 years, traveling some 15,000 kilometers in the process. He’s raised just under $200,000 Australian dollars so far. “You come around the corner and see the expression on people’s faces of amazement,” he says. His journey this year started in Adelaide then went up to Melbourne, on to Tasmania, back to Melbourne to Canberra, and over to Sydney. He’s averaging 200 kilometers a day. Along the way, he’s collecting all sorts of interesting stories. Others just appreciate the original idea, though they should probably appreciate the execution too. Riding a lawnmower across Australia is a complicated, bureaucratic activity. For starters, he’s not allowed to cut any lawns. Australia won’t allow you to drive a vehicle with blades on roads. Secondly, he needs permits to ride in some Australian states. Alford is accompanied on his rides by a support staff of 8-11 people, all Rotarians. So if you see him, give him a wave and a donation. If you’ve seen him in the past, share your stories in the comments field. – This morning is the much anticipated 3k walk at Cathy Freeman Park to raise awareness for Rotary and polio eradication. – The Billabong House of Friendship opens today. Over 14,000 square meters of display space is set up with more than 300 exhibits of Rotary work. President Ron Burton will open the house this morning. – At ANZ stadium, Rotary alumni are gathering for a celebration, which will go until noon. Speakers include G. Kenneth Morgan, Ray Klinginsmith, Kalyan M. Banerjee, and others. – The Water and Sanitation Rotarian Action Group is meeting at Novotel in the Parklands Room. – The Delltones Iconic Australian Male Vocal Group will be performing live at the House of Friendship from 11 a.m. to noon. – Accompany President Burton for a New Generations Celebration at ANZ Stadium (enter through gate C/D) from 3:45 p.m. to 6:30 p.m. This is only a taste of what’s happening at Sydney Olympic Park today. Be sure to download the Rotary convention mobile app for the full schedule. Also let each other know what you’ll be attending in the comments field below. This may not be your prototypical flashmob experience, but if you’re up for a new adventure, a little fun, and a chance to meet new Rotarians, this event is for you. Rotarians are organizing a geocaching flashmob meet-and-greet, a chance to mingle with old friends and meet new ones. If you’re not familiar with geocaching, here’s a little background. Whatever you do, stay away from light tower number 6 until your GPS clock reads exactly 14:30.